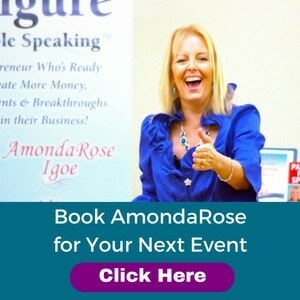 Book AmondaRose to speak for your organization and make your next event unforgettable! Out of the thousands of speakers to choose from for your next event, AmondaRose is unlike any other speaker. 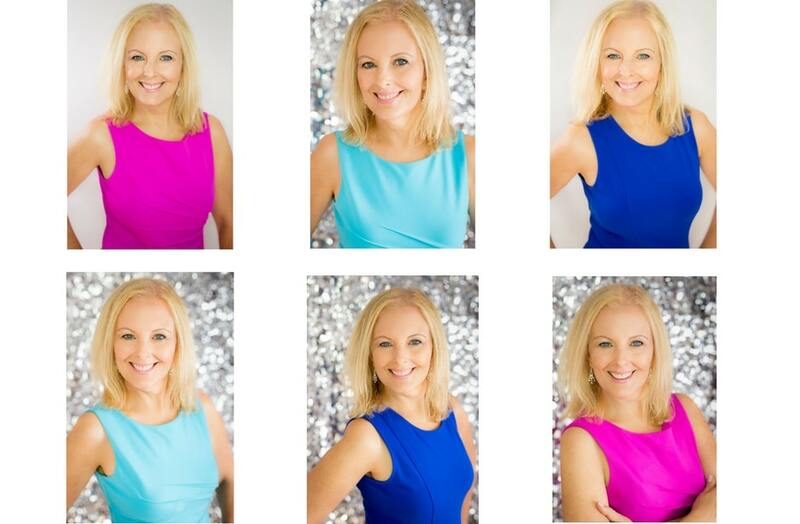 Whether AmondaRose is being interviewed on television or speaking to international audiences, she ignites the atmosphere with her empowering message, intuitive insights, contagious enthusiasm and real results. AmondaRose’s unique fusion of real life examples, content rich strategies and authentic conversational style connects with her audience at an intimate and heartfelt level, which makes her a highly sought-after professional speaker. in public speaking training and presentation development for business owners, entrepreneurs and visionary leaders. She has an undeniable passion for helping both women and men share their passionate message to the masses so they can finally have impact, influence and income they desire. Post event surveys have ranked AmondaRose as the top speaker for giving audiences the highest content value and for her dynamic and down to earth presentation style. When looking for a Professional Speaker and Trainer who specializes in Public Speaking look for one that ignites the atmosphere, look no further than AmondaRose. Because AmondaRose’s puts her heart and soul into every presentation, you can feel confident your audience is getting the 100% absolute best. 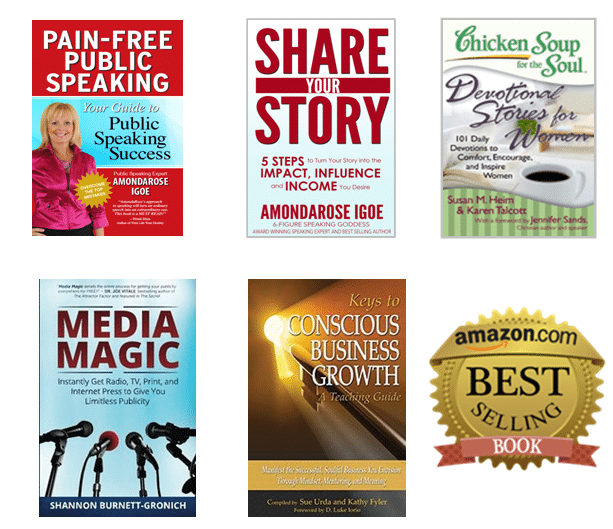 As an Award Winning Speaking Expert and Best Selling Author, the power of what AmondaRose teaches has helped thousands from over 20 countries globe including North America, France, Germany, Switzerland, Romania, England and Australia. AmondaRose was recently recognized by the International Association of Women in Business Coaching receiving their “Stars Achievement Award” and honored by The Woman’s Advantage with their “Top-Idea Maven” award. She was a featured leading expert on television. She is the author of two books, “Pain-Free Public Speaking” and “Share Your Story” and a Contributing Author in the #1 Best Selling Book Series “Chicken Soup for the Soul.” Her clients and audiences attest that after working with AmondaRose, the benefits to them have been priceless. AmondaRose is available for speaking engagements for associations focused on business owners and entrepreneurs, personal development and business growth events, and industry-specific trainings. AmondaRose is widely regarded as an expert in the field of powerful public speaking for a reason. Because AmondaRose’s puts her heart and soul into every event, you will be giving your audiences the best. When you work with AmondRose you will know that she is 100% committed to exceeding expectations and over-delivering on every level. “I knew if anyone could motivate our ultra-shy group to participate, it would be you. However, you exceeded my wildest expectations. From the moment you took the stage until the time you walked out the door, you captivated every single person in the room. People, I knew who would hide in pure terror were volunteering to come to the front of the room. You unselfishly gave the group the tools to take their projects to the next level. 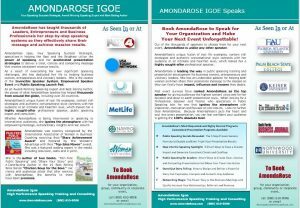 “AmondaRose Igoe is an engaging and compelling speaker. She energizes her audiences in the most diverse settings, ranging from workshops to keynotes, from small gatherings to large crowds. She has her message down-packed as far as content and delivery is concerned and provides a truly life-transforming experience to attendees through audience participation, eye opening exercises, real life examples, and deep insight. AmondaRose enjoys the direct interaction with her audiences and knows how to direct the flow of energy and attention in the room. “Honor & Privilege of having AmondaRose Igoe as their speaker at our event. AmondaRose presented techniques and strategies to help our members become an outstanding, powerful and confident speakers. The techniques were tested that night among the business women who found them to be a great asset to their business careers. “WOW! AmondaRose is a joy to know and an ideal speaker to work with. She is totally prepared, completely selfless and a true professional. Her presentation style is warm and giving even as she provides the ‘nitty gritty, nuts and bolts’ to the audience. Her message is clear and concise, and she makes sure that everyone in the audience is with her as she moves through the material. for your organization, group, community or corporate event.